An aquarium filter is important to any aquariums, unless you want to do the weekly chore of cleaning your tank and replacing the water. It lifts off the weight of manually seeing through the rigorous maintenance of your aquarium, not to mention that it greatly improves its water quality. Most fish tanks require filters to maintain the upkeep and increase the health of the tank’s inhabitants. This article will help you choose the top 5 aquarium filters with our in-depth review. Top 5 Aquarium Filters At A GlanceWhat Is The Purpose Of An Aquarium Filter?What Are The Types Of Filtration? What Is The Purpose Of An Aquarium Filter? A filter plays a vital role to the aquarium. Its purpose is to clean the water of the aquarium off toxic elements that causes harmful buildup of ammonia and nitrates which may come from different sources. Your fish or other aquarium inhabitants such as turtles constantly excretes wastes as it goes around swimming your tank. Uneaten food, decaying organic matter, plant debris, and other external particles which contribute to the contamination and deterioration of the water quality, can then lead to negative effects on your tank’s occupants. These toxic elements can be removed by an aquarium filter which also aerates the water to help keep the tank’s environment healthy. What Are The Types Of Filtration? Biological filtration: – In this method of filtration, the nitrogen is managed by bacterial processes. Different types of bacteria convert the toxic chemical contaminants coming from uneaten food, fish excrements, and dead plants inside an aquarium into less toxic nutrients by oxidizing ammonia. These beneficial bacteria live on your aquarium. They can grow into large colonies in foam filter pads, bio-balls, and ceramic rings. Mechanical filtration – This type of filtration is the process involves the removal from the water of particulate material such as the toxic waste excrements of the aquarium inhabitants and decaying food. This can be done physically by hand or by installing a mechanical filter that forces the water through a media that sifts and traps these harmful particles. If you are using filter media, the maintenance process will require you to regularly replace or clean it. Chemical filtration – The chemical filtration works by removing toxic chemicals such as dissolved wastes as the water passes through a chemical media. The commonly used chemical filters are activated carbon and foam fractionation. The activated carbon attracts certain chemicals and remove them from the water. Using activated carbon typically requires monthly replacement. What Are The Different Kinds Of Aquarium Filters? Canister filter – The canister filter works by pressurizing the water to enter the filter media inside it through an intake pipe. The return pipe then pumps back the clean water into the tank. This type of filter has a lot of strengths compared to other types of filtration. It offers flexibility and versatility when it comes to using different filter materials. It provides a high volume of filter material. It can be maintained regularly without disturbing the aquarium’s inhabitants. Power filter – This type of filter that is usually hanged at the back of an aquarium, is powered by an impeller that draws the water from the tank through a tube. It(1) pumps it into a series of different media or cartridge before being pumped back to the tank. Power filters usually require simple maintenance which makes them ideal for those who are just starting with their aquarium hobby. 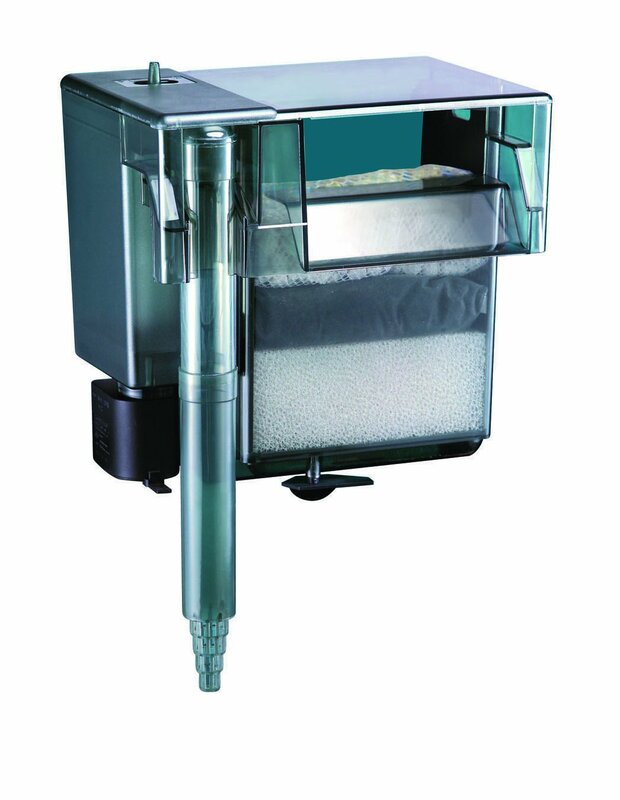 Internal filter – The internal filter is installed inside the aquarium and includes a sponge filter, a foam cartridge, or an undergravel filter. The filtration process is accomplished through an air pump which moves and releases water inside the filter. Undergravel filter – Undergravel filters make use of an absorbent plate that is placed underneath the substrate. It has multiple tubes that extend upward. Air stones are placed at the base of the tubes. Water is then drawn through the substrate and up through the tubes. Wet/dry filter – If you have a saltwater aquarium, then this type of filter is ideal for you. This type of filter is located either beneath the aquarium and uses an overflow device or on top of it which uses a water pump and draws water from a filter material. Is an aquarium filter really necessary? In conclusion, aquarium filters are essential. While there are certain types of fish and tanks that don’t require filters provided that water changes are done as often as possible and visible waste materials are physically collected, there are functions of a filter that are indispensable. You will risk accelerated pollution growth in your tank and health deterioration of its inhabitants. There will always be uneaten food left after feeding your fish, waste excrements will always be released by the tank inhabitants, other debris will come in contact with the water. So, getting an aquarium filter is a time-saving way to maintain the water quality. It can also mean life-saving for your tank inhabitants since aquarium filters manage water movement and the nitrogen cycle efficiently as well as helps in producing clear water that makes you tank visually pleasant to look at. Aquarium filters are common in the world of aquarium hobbyists. There are plenty of models and brands to choose from, each offering its own aquarium filter technologies. To help you in choosing the right one, we have narrowed the search down to the 5 top-rated aquarium filters. The Marineland Emperor 400 Pro Series Bio-wheel Power Filter operates with an advanced filtration technology. This Hang On Back (HOB) filter features an efficient two-pump design that can hold multiple filter media. Water goes through multiple filtration stages thanks to this product’s biological and chemical filtration capability. It has a good flow rate of 400gph and it can sustain an aquarium size of up to 80 gallons. Maintenance is also not difficult when it comes to this aquarium filter. Solid and user friendly design. Filters can be rinsed without replacing them as often. Consistently keeps tank water crystal clear. Pump problems with low water levels. 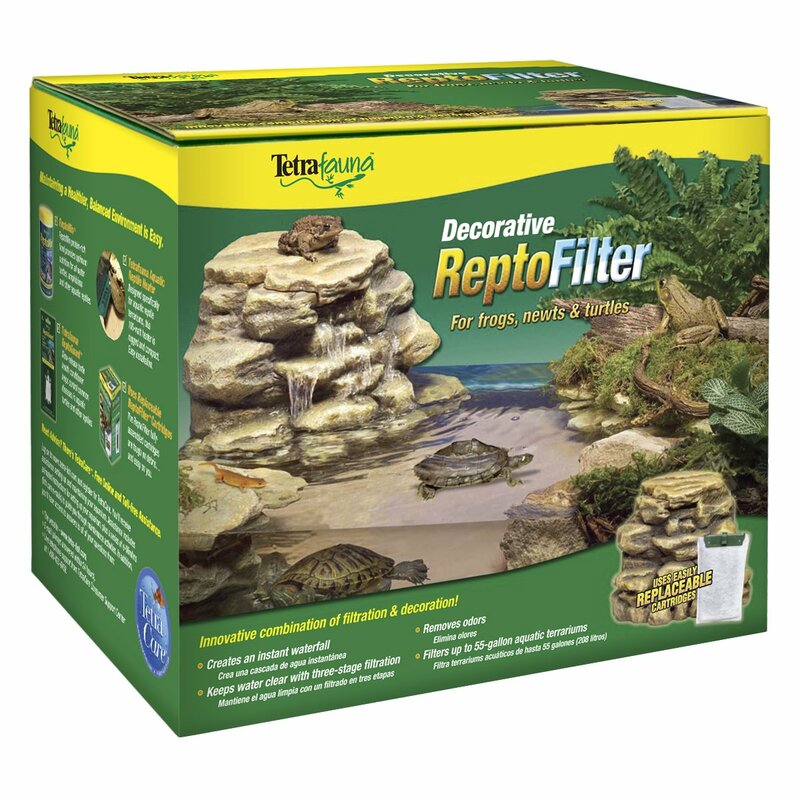 The ReptoFilter is a unique filter because it not only provide good filtration but also gives your aquarium an added touch of nature with its beautiful design, which your frogs or turtles can play around and relax on . It is an aquarium filter that doesn’t like one. This decorative filter works in any aquariums with a size of up to 55 gallons. Its features include a three-stage filtration system which uses a filter media that helps in keeping your tank water clear and odor-free. The filtration system operates quietly. It works just like the other filters in this list but its visually appealing design is certainly hard to ignore. Difficulty cleaning the internal crevices. Basking area can be steep to climb. The Whisper In-Tank Filter is mounted inside the aquarium instead of being hung from the outside. It is held in place by suction cups and brackets. 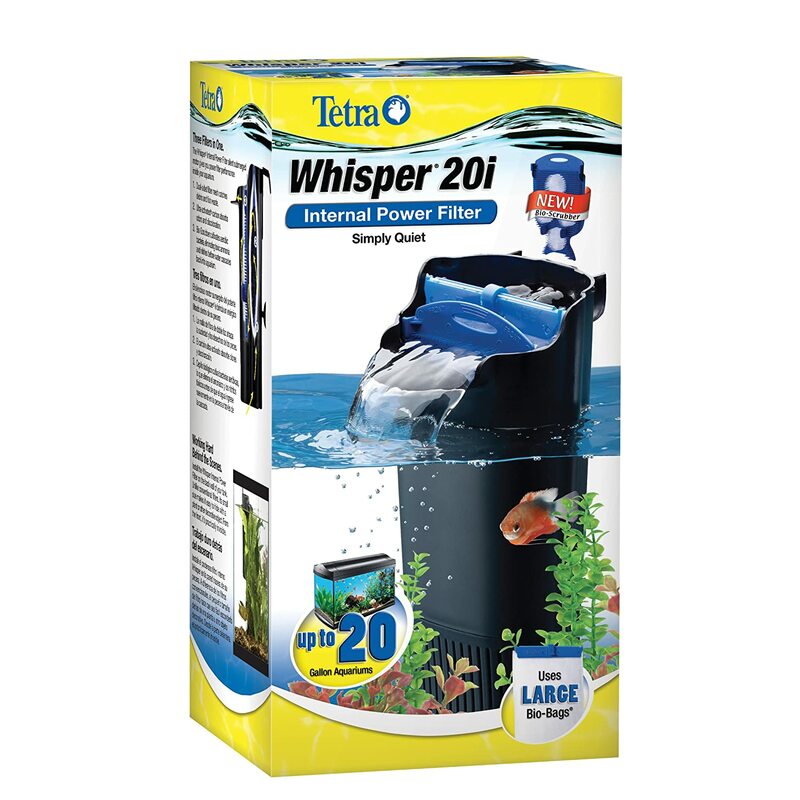 This aquarium filter is ideal for smaller sized aquariums of up to 20 Gallons. This filter removes wastes in your tank with its 3-stage filtration system. Even if this is an internal filter, it offers the same high-qualify filtration performance as those of external filters. This filter also shows flexibility. It can function even with little water on your tank, making it ideal for your turtles. It has no problem adjusting to your water level. Cartridges can be replaced easily. Works well even at low water levels. Problems if hung on the back of the tank. 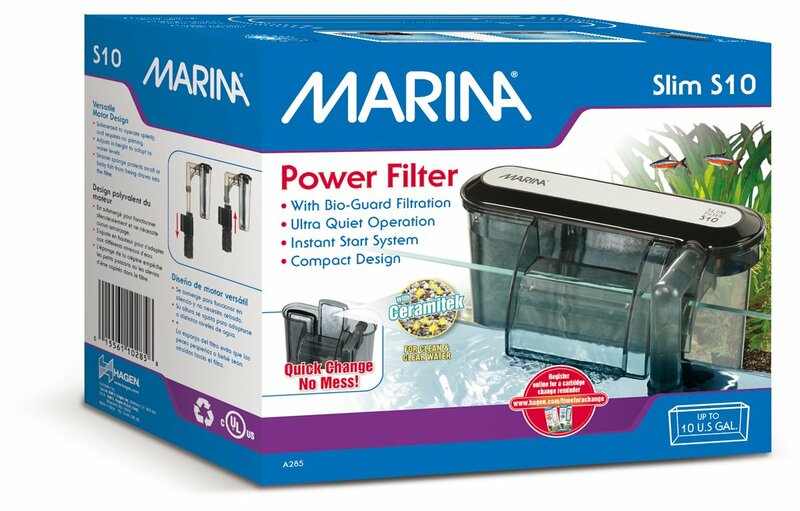 The Marina Slim S15 Power Filter's compact, slim, and sleek profile is great for those who want to save up aquarium space. This aquarium filter gives you the option to conveniently adjust and control the water flow level in your tank. Its motor is submerged in the tank ensuring a quiet operation. This filter can be used easily, start-up doesn’t require priming. Installation won’t give you a headache because it is easy to get this thing started. Maintenance is also quick and simple. Another wonderful thing about this product is that it features a technology that optimizes the biological filtration of your tank water. Multiple compartments for filter media. Takes less space with slim design. Not enough filter media included. Lid can be easily knocked off. The AquaClear Power Filter introduces a superior, efficient, and powerful refiltration system. It includes good filter media and an energy efficient pump that contributes to lower operating costs. It boasts of a quick and easy installation process. It can filter water volume of up to seven times more than other available aquarium filters. It comes equipped with high-quality and highly-efficient filter media for a successful biological filtration. 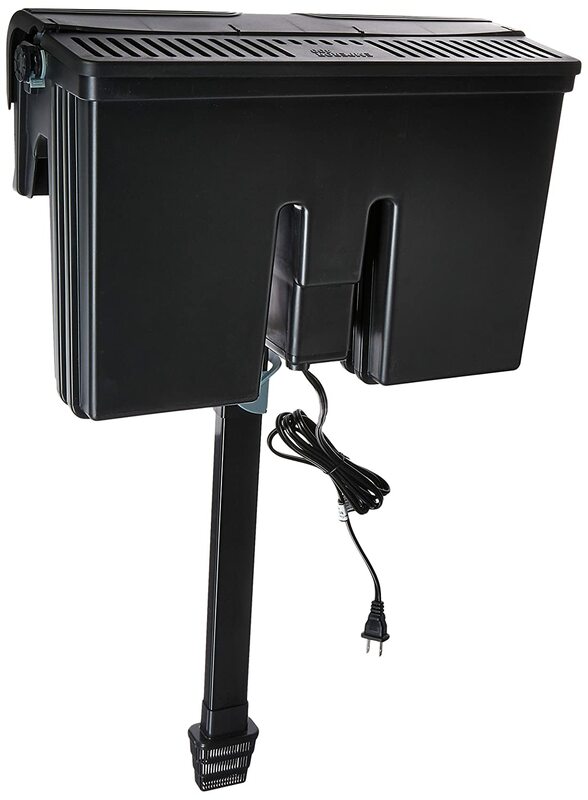 This filter model is ideal for aquariums with a size of up to 20 gallons. To cap it off, this product gives its owners a product warranty of 2 years. Cleans well with its 3 filtration layers. Makes low grinding and rattling noise. Insufficient and inefficient media included with it. Aquarium filters perform the important function of cleaning the water of any buildup of toxic elements. Neglecting this can cause deterioration of the water quality and eventually deterioration of the health of the tank’s inhabitants. We have reviewed the top 5 aquarium filters, after checking their specs, features, design, and functionality, we choose the Marineland Emperor 400 Pro Series Bio-wheel Power Filter as the best among them. This filter comes out as the winner because of its smooth and efficient filtration capacity. It gives you optimal water quality. It’s maintenance process is also hassle-free and simple. How about you, which among these is the best aquarium filter for you? If you have a turtle tank, and looking for a best filter for it, this article will help.